The Anxious Lawyer is a superb introduction to the why and how of meditation for lawyers. The authors, both lawyers themselves, guide you through a simple eight-week program for starting a meditation practice. Along the way, they help you understand how mediation can enhance not just your personal well-being, but also your professional practice and career. Much more than a how-to manual or text, the book speaks to the reader as a friend while providing amazingly useful insights. It reveals how meditation can help us find satisfaction and fulfillment in law as well as in life. Practical and actionable. The authors came to meditation as practicing attorneys and they make the practice of meditation and mindfulness handily accessible for fellow attorneys. The authors break it down beautifully with personal anecdotes and the science, misconceptions, and mechanics, of meditation and provide a painless, at-your-own-pace program to get you started on the path to forming a new habit that could potentially transform your life. 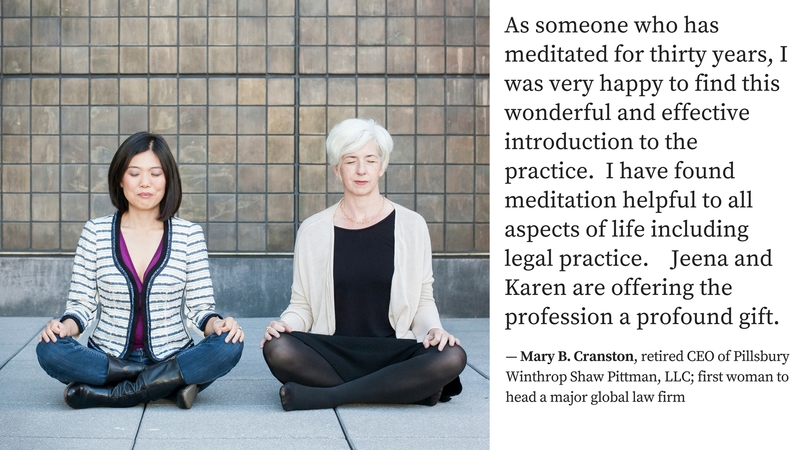 In this book, attorney Jeena Cho and Karen Gifford make a clear, concise, and convincing case in favor of the benefits of mindfulness and meditation for lawyers—a segment of the population that is particularly prone to depression and anxiety due to the stresses and adversarial nature of our profession. If you’re an attorney and reducing anxiety is a priority, this book is a great place to start. — Nicole Black, lawyer and Legal Technology Evangelist at MyCase. As someone who has meditated for thirty years, I was very happy to find this wonderful and effective introduction to the practice. I have found meditation helpful to all aspects of life including legal practice. While the “thinking mind” is a critical tool for lawyers, meditation relaxes the thinking mind, allowing new and creative insights to surface. Most of my best trial strategies and business initiatives emerged in this way! But the real benefit is the peace and calmness that meditation has added to my life. Jeena and Karen are offering the profession a profound gift. As an attorney who has struggled with substance use, eating disorders and other mental health issues, mindfulness has been an invaluable tool in my recovery. It is great to see Jeena and Karen leading the way with The Anxious Lawyer. The mindfulness movement in law has been criticized for distracting lawyers’ focus from the needs of the client to those of the lawyer. But today’s increasingly stressed-out, indebted, hostile, overworked, unmindful, lawyers will never be effective advocates or counselors for their clients without the tools to understand and manage their inner lives. The journeys, instruction, and, most significantly, examples that Jeena Cho and Karen Gifford provide in The Anxious Lawyer are not only enlightened but desperately needed in the legal profession. A wonderful, detailed guide to meditation highlighted with intriguing and relatable personal stories that all professional women can learn from and enjoy! As a physician, I know that my life and stress can be improved by implementing the lessons in this book. This book cultivates personal insight and ability to filter surrounding influences which are invaluable strengths for personal and professional success. Anxiety and depression are rampant in the legal profession. But what can we do about it? Jeena Cho and Karen Gifford have come forward with a great book that answers that question: meditate. Well-organized and practical, a great read for those of us who struggle. The statistics are staggering, the anecdotes are everywhere you turn, and speaking to law students and lawyers across the country I can tell you it is true– our profession is overwhelmed by stressed and depressed attorneys. Jeena helps us to find saner and more productive ways to navigate the pressure and responsibility that comes with the practice of law. The Anxious Lawyer provides a wonderful guide to meditation — practical, thorough, and beautifully tailored to the needs of attorneys. I’m thrilled that this book is now available — not only because it will the support the wellbeing of lawyers around the world, but because it will allow them to better support the wellbeing of others. This book fills the void created by the earnest and serious business of law with a blueprint to happiness and to good health. In 8-weeks, this DIY guide provides a lifetime of tools necessary to take your career and your personal life on a journey to a better and more fulfilling place. Read, practice, smile, repeat. Jeena Cho and Karen Gifford have filed this hardcopy toolbox with stories, step by step instructions, practices and tools that will lead even the busiest person to a happier place where doing less is more. This book is a great read, that takes you on a journey you can follow for the rest of your life. Jeena Cho and Karen Gifford use their personal stories to illustrate the power of mindfulness. Their approach makes mindfulness practices accessible to lawyers and relevant to their work. Their book not only helps lawyers develop more fulfilling professional lives but also improves the legal system by making social interactions among lawyers and clients more positive. However, the greatest gift The Anxious Lawyer offers is an opportunity to explore the meaning and purpose of your life. This book is both personal and profound, and its words are to be both read and experienced. This is a lovely book. Any anxious lawyer, or any lawyer seeking to become more centered and happy, will find treasures in Jeena’s and Karen’s personal stories, their practical advice for the special problems facing lawyers, and their easy-to-follow guide for starting a meditation practice. This book could not have come at a more important time. We are so distracted: by our technology; by a rapidly changing legal and business climate; and most of all by our own minds- desperately trying to make sense of it all. The Anxious Lawyer offers practical guidance on how to create the space we need- professionally and personally- not just to survive, but to thrive. These are stressful times for lawyers. In my work promoting increased professionalism, I see over and again that stress is a huge contributing factor to the problem of overly-aggressive and uncivil lawyer behavior. The Anxious Lawyer contains a treasure trove of practical advice for reducing stress and reflexive action through meditation techniques. I recommend this book to any lawyer seeking to have a more satisfying personal life and professional career. Lawyers are a hearty bunch. We work long hours, internalize the plight of our clients and we’re chronically stressed from being immersed in conflict. This is all exacerbated by opposing attorneys who relish pushing the boundaries of ethics to the breaking point. The Anxious Lawyer provides a solution; mindfulness and meditation for lawyers, written by lawyers. I highly recommend this book to enable my colleagues to reduce stress and anxiety, and to increase self-awareness, focus and concentration. Readers will appreciate the deliberate roll out of exercises and the interleaving of “workbook” pages to both engage and self-educate. There are many superb books on mindfulness but few that offer practical insights and tips for legal professionals and Cho and Gifford have done our profession a service by offering this thoughtful treatment of mindfulness and related contemplative practices. Anyone who has a busy professional life serving others, whether it is in the legislature, the boardroom or the courtroom, can benefit from a daily practice that mitigates stress, improves focus and helps reconnect us with ourselves and our own values. This book offers an easy to follow program for beginning a meditation practice, written by lawyers and for lawyers. I highly recommend this book for anyone in the legal world who has wondered about meditation but hesitated to get started. Like psychiatrists, lawyers take on their clients’ problems as their own. But unlike psychiatrists, nothing in our professional education prepares us for the devastating emotional toll that can take. Lawyers lead professions in depression, substance abuse, and suicide. This need not be part of the legal profession that we take for granted. 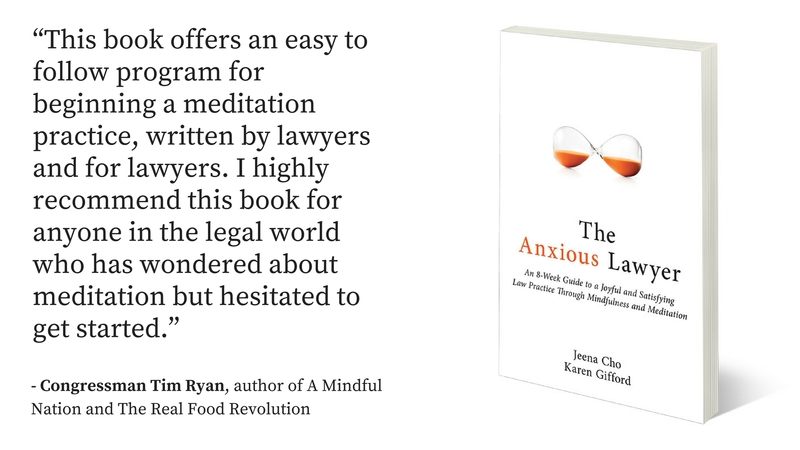 The Anxious Lawyer is an important book: a practical, week-by-week guide to help cope with stress and anxiety through meditation and mindfulness — written for lawyers, by lawyers. Lawyering is stressful by nature, and many lawyers suffer in silence or leave the profession rather than cope. Jeena Cho and Karen Gifford make a convincing case that lawyers should lead an examined life to deal with stress effectively and be happier. Their suggestions for a methodical and thoughtful approach to anxiety are essential reading for anyone who wants to master their stress rather than letting stress manage them.